The number of fields which began producing oil and gas in the U.K. hit its highest level for five years in 2013, as a number of operators focused on development activity. This is according to the latest report into offshore activity from Deloitte, the business advisory firm. The report, detailing activity across North West Europe over the last 12 months and compiled by Deloitte’s Petroleum Services Group (PSG), found the number of U.K. fields which started production rose by 44% in 2013 (up from nine in 2012 to 13 in 2013). This figure represents the highest number since 2008, when 16 fields were brought on-stream. Of the 13 fields brought on-stream last year, 84% were eligible for tax allowances, pointing to a positive industry reaction to the government incentives in place. However, a total of only 47 exploration and appraisal wells were drilled on the U.K. Continental Shelf (UKCS) in 2013, compared with 65 in 2012 – a decrease of 28%. During the same period, the Norwegian Continental Shelf (NCS) saw a 41% increase in drilling activity. Graham Sadler, managing director of Deloitte’s PSG, said that more needed to be done to encourage drilling on the UKCS, including incentives for exploration activity. 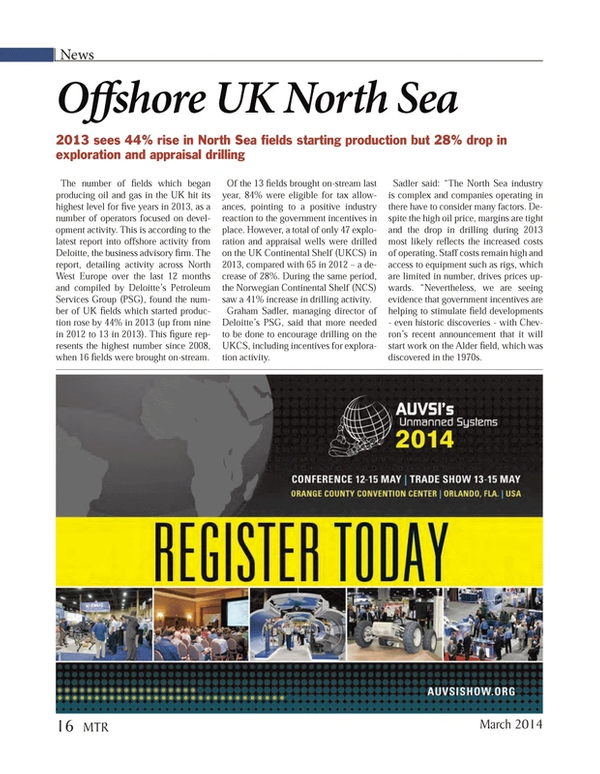 “The North Sea industry is complex, and companies operating in there have to consider many factors. Despite the high oil price, margins are tight and the drop in drilling during 2013 most likely reflects the increased costs of operating. Staff costs remain high and access to equipment such as rigs, which are limited in number, drives prices upwards." Sadler continued, “Nevertheless, we are seeing evidence that government incentives are helping to stimulate field developments - even historic discoveries - with Chevron’s recent announcement that it will start work on the Alder field, which was discovered in the 1970s.